Many piping plover and American oystercatcher pairs have been busy laying their eggs over the last few weeks. As beach nesting bird biologists, we invest a lot of time into every pair at our sites. We revel in their successes and feel defeated at their losses. Unfortunately, many nests did not fare well in the April 25th Nor’easter that was coupled with new moon tides. Luckily, it is early enough in the season that all of them have begun, or will soon begin, attempting new nests. The breeding habitat of the American oystercatcher in New Jersey consists of coastal beaches, inlet systems, and salt marshes. Population estimates in New Jersey suggest 350-400 breeding pairs can be found here from March through August. 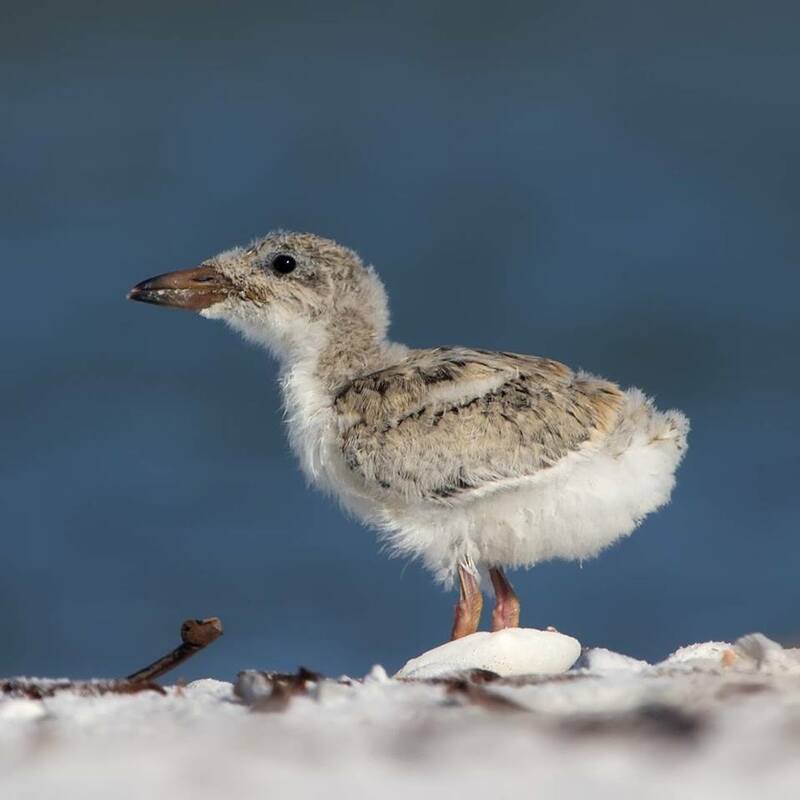 Much of the monitoring and research done with American oystercatchers in New Jersey takes place on the coastal beaches where other beach nesting birds, such as piping plovers, least terns and black skimmers, are found. In 2016, more than 120 breeding pairs of beach nesting American oystercatchers successfully fledged 83 chicks. This was an especially productive year for those pairs and productivity levels were well above the target goal of .5 chicks per pair. Photo courtesy of Sam Galick. Oystercatchers arrive back on their breeding grounds here in New Jersey in early March to set up breeding territories and begin nesting. Once paired up, adults typically lay one to three eggs. Both the male and female will take turns incubating the nest for 28 days. Once chicks hatch, they are semi-precocial, which means they are born in an advanced state, but are still reliant on adults for food and protection. Oystercatcher chicks are fledged (or able to fly) 35 days after hatching. After fledging, most Oystercatchers migrate to the southeast, but a wintering population does remain here in New Jersey. American oystercatchers are listed as a Species of Special Concern in New Jersey. A “Species of Special Concern” is a status determined by the New Jersey Division of Fish & Wildlife and applies to species that have an inherent threat to their population or have evidence of recent population declines. Since American oystercatchers share the same habitat as other endangered or threatened beach nesting birds (piping plovers, least terns, and black skimmers), they also share the same threats to their nests and young. Human disturbance, a host of predators, and flooding events, such as the one that took place last week, are just some of the many threats beach nesting birds face daily. 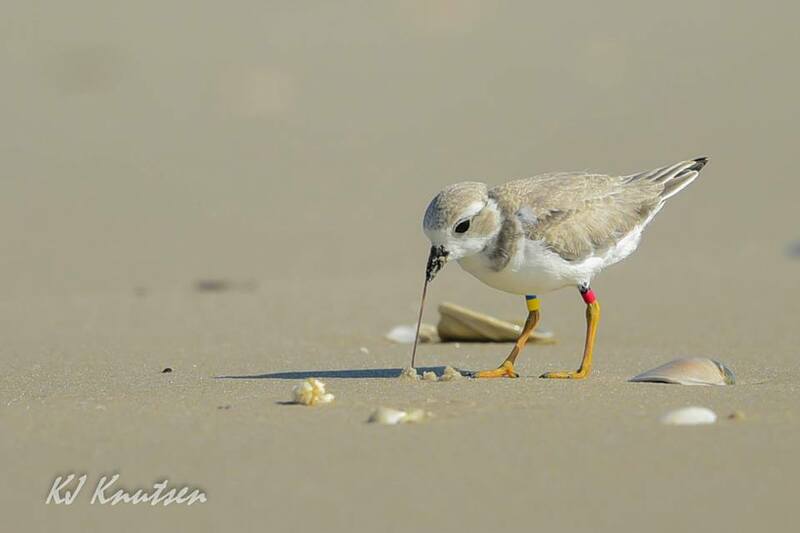 The Conserve Wildlife Foundation of New Jersey has long partnered with the New Jersey Division of Fish and Wildlife’s Endangered and Nongame Species program in the monitoring and management of New Jersey’s endangered beach nesting birds. Fencing and signage are placed in nesting areas to alert beachgoers to the presence of nesting American oystercatchers and other beach nesting birds. Throughout the summer, CWFNJ and partners will be out on the beaches monitoring and collecting data that will be used to track population trends and identify threats to oystercatchers and their young. Emily Heiser is a wildlife biologist for Conserve Wildlife Foundation of New Jersey. There are many ways to gauge success for our beachnesting bird project. We look at how well our management tools work, the effectiveness of our partnerships, and how well our educational efforts work, to name a few qualitative measures we use. At some point, however, it comes down to cold hard numbers, how well did the birds do in a particular season and over the long-term. We are at that point in the season, and for the most part, I am happy to report it has been an excellent breeding year. I will caution that these are still preliminary figures, some quality checking of the data needs to be done before they are final, but the trends are clear. One of a “bumper crop” of piping plover fledglings produced in New Jersey in 2016. Photo courtesy of Kevin Knutsen. First up are piping plovers. We will come in at ~115 pairs statewide, up modestly from the 108 pairs in 2015, and the second consecutive year of an increase after hitting our historic low of just 92 pairs in 2014. So, we have climbed back closer to our long-term average, but there is still room to improve. The really good news is our productivity this year – close to a statewide record at 1.37 chicks fledged per pairs – puts us in the position to continue our population increase. If trends hold, because piping plovers demonstrate high site (or region) fidelity, when we produce a lot of fledglings, our breeding population rises in the next year or two. With three straight years of well above average fledgling rates for New Jersey now in the books, our prospects look good in the short term for our breeding population levels. Least terns and black skimmers, which nest in colonies, sometimes numbering hundreds (or even thousands), are more challenging to count and assess, but we had at least modest success this year for both species. As is typical, our least tern colonies were variable, with some completely failing and others being highly productive. The Monmouth County region, one of our strongholds for least terns in New Jersey, didn’t have one colony that was a standout but most of them had at least some success. In South Jersey, our two largest colonies at Holgate (EB Forsythe NWR) and Seaview Harbor were very successful and helped make up for losses and failures at other colonies. The majority of our state’s black skimmers are concentrated in one large colony at Seaview Harbor, and although skimmers are our latest nesters (so the season isn’t quite over for them), they appear to have been very successful there, which means a good season overall for the state. We also track American oystercatchers, although only for the portion that nest on the barrier beaches and spits. Because the biggest percentage of oystercatchers in the state nest on back bay and marsh islands, we cannot determine true statewide population or productivity levels, but the population on the beach habitat appears to be rising in recent years. Typically breeding success is lower for oystercatchers on the beach habitat due to high levels of human disturbance and predators, but productivity has been relative high the past two years. Of particular note this year was Stone Harbor Point, where a record number of 27 pairs nested and produced over 30 fledglings. The reality is our beachnester staff works just as hard in years when the birds do poorly, as when they do well like this year, but it is SO much more rewarding when we have a good season. So as we wrap up the season, we are all feeling in a bit of a celebratory mode now! Beach nesting bird chicks, such as this black skimmer – New Jersey’s first skimmer chicks hatched this weekend – are especially vulnerable to the extra large crowds and fireworks on the beach during July 4th celebrations and other busy summer weekends. Photo courtesy of Jean Hall. While the July 4th holiday weekend is the celebratory peak of the summer season for beachgoers, it is not a joyous time for beachnester staff or beach nesting birds. The holiday brings an extra crush of people out on the beaches at the most critical time for our endangered nesting shorebirds. Nearly all the species – piping plover, least tern, black skimmer, and American oystercatcher – are at the peak of their breeding seasons in late June/early July so the holiday is sometimes a “make it or break it” day or in the case this year a long weekend. So our beachnester staff went into overdrive this weekend, working extra hours to guard and monitor nesting sites, both day AND night. Fireworks, the symbol and heart of any July 4 celebration, are especially problematic. The disturbance from the fireworks themselves can be an issue, but the extra large crowds (and typically extra boisterous behavior) on the beaches at night can be a deadly combination for the beach nesting birds. Personal fireworks in proximity to nesting colonies also have to be “policed” by our staff and volunteers. With this year’s holiday now just passed, it looks like our efforts largely paid off. There were areas where protective fence was vandalized and had to be restored, and some minor bird losses were documented this weekend, but it was fortunately minimized this year. With that in mind, we are sending an extra special thanks out today to the dedicated beachnester staff members and volunteers, not just in New Jersey but across the entire breeding range, for their hard work this weekend and throughout the season. The bird’s still have several weeks to go before we’ll know if the season was a success overall (stay tuned for that news), but “holding down the fort” on July 4 is one more challenge that is now in the books for this year. Conserve Wildlife Foundation is thrilled to release a new video as an “introduction” to our work, keeping New Jersey’s wildlife in our future! We are a private, non-profit organization dedicated to the protection and preservation of New Jersey’s endangered and threatened wildlife and the habitats they depend on. As the video demonstrates, we utilize science, research, wildlife management, habitat restoration, education and volunteer stewardship to help conserve and protect a variety of at-risk species of wildlife in New Jersey, the most densely populated state in the nation. The video was produced by Tyler Grimm, a video intern with Conserve Wildlife Foundation. Want to get involved? Learn more about Conserve Wildlife Foundation on our website. Did you know barrier island beach makes up approximately 2% of the Edwin B. Forsythe National Wildlife Refuge? This area is the most productive for beach nesting birds. The federally threatened piping plover and other species such as least tern, black skimmer, and a species of special concern, the American oystercatcher, nest on Holgate Beach. The refuge closes the Holgate unit from April 1st to September 1st every year to provide undisturbed nesting habitat for these important species. Not only is it important to protect nesting habitat for the birds, but it is also important to provide education opportunities to the public. Each summer, the refuge relies on volunteers during the summer months to talk to the public about the beach closure and bird management, and answer any general questions about Forsythe Refuge. CWF Field Technician Jesse Amesbury tracking piping plovers at Holgate with his scope. Edwin B. Forsythe National Wildlife Refuge protects more than 47,000 acres of sensitive wetlands, marshes, and coastal habitats along the New Jersey shore. It is one of the most important habitats for migrating waterfowl and shorebirds east of the Mississippi River.